Human embryonal carcinoma cell line 2102Ep. Our Abpromise guarantee covers the use of ab16287 in the following tested applications. Flow Cyt Use a concentration of 15 µg/ml. Glycosphingolipids function as mediators of cell adhesion and are modulators of signal transduction. SSEA-4 (Stage-Specific Embryonic Antigen 4) is a glycolipid expressed early in embryonic development and in pluripotent stem cells. This antibody was first described and named as part of a series of embryonic antigens, defined by monoclonal antibodies isolated in the lab of Prof. Davor Solter (Kannagi, R. et al., 1983, EMBO J. 2:2355). SSEA-4 can be used as a marker of human embryonic stem cells, human embryonic carcinoma cells and human embryonic germ cells. Monoclonal antibodies to this target have been widely used in the characterization of pluripotent stem cells. Mouse pluripotent stem cells are not recognised by anti-SSEA-4 antibodies but do express the antigen upon differentiation. 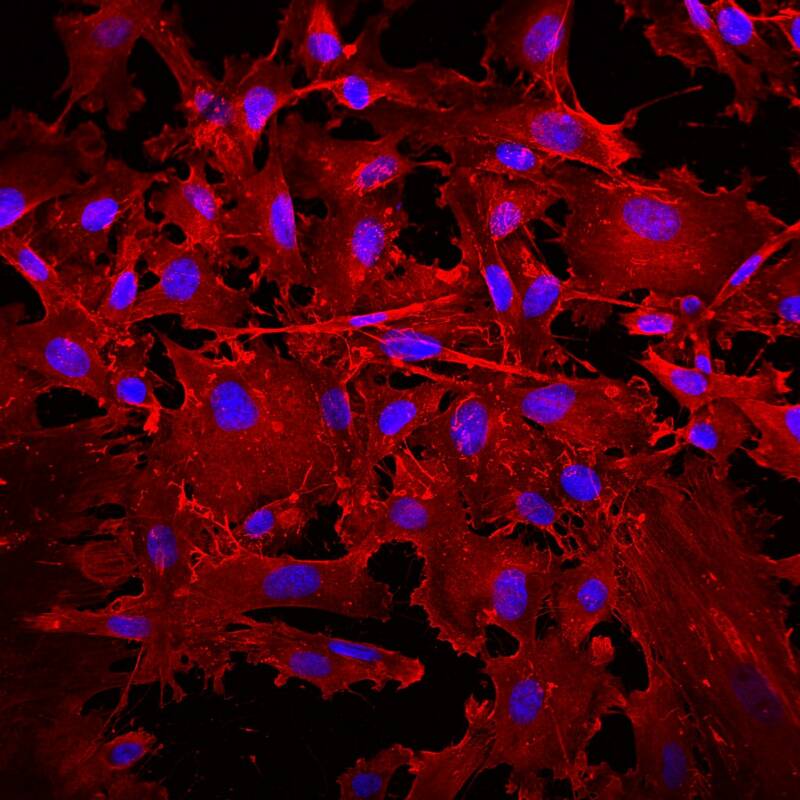 ab16287 staining SSEA4 in rat tendon derived stem cells by ICC/IF (Immunocytochemistry/immunofluorescence). Cells were fixed with paraformaldehyde, permeabilized with 0.25% Triton X-100 in PBS and blocked with 1% BSA for 30 minutes at room temperature. Samples were incubated with primary antibody (1/100) for 20 hours at 4°C. 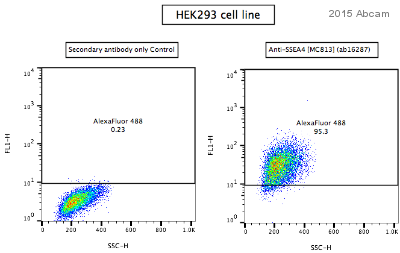 An Alexa Fluor® 594-conjugated donkey anti-mouse IgG polyclonal (1/1000) was used as the secondary antibody. Immunocytochemistry/ Immunofluorescence - Anti-SSEA4 antibody [MC813] (ab16287)Image from Ferro F et al., PLoS One. 2012;7(7):e41774. Epub 2012 Jul 23. Fig 6.; doi:10.1371/journal.pone.0041774; July 23, 2012, PLoS ONE 7(7): e41774. 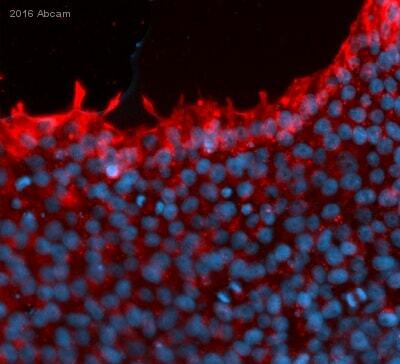 Immunofluorescence analysis of Human dental pulp stem cells, staining SSEA4 with ab16287 at 1/40 dilution. A FITC-conjugated anti-mouse IgG was used as the secondary antibody. Immunocytochemistry/ Immunofluorescence analysis of human iPSC cells labeling SSEA4 with ab16287 at 1/500 dilution. Cells were fixed with paraformaldehyde and permeabilized with 0.5% TX100. Cells were blocked with 5% serum for 20 minutes at 25°C. 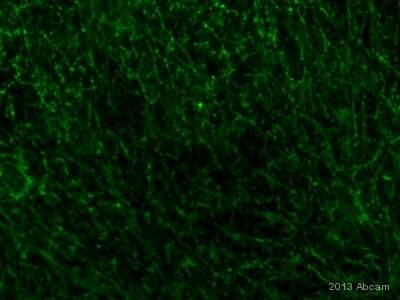 A goat polyclonal anti-mouse Cy3 secondary antibody at 1/500 dilution was used. anti-SSEA4 antibody, ab16297 can be used as a marker of Embryonic Carcinoma cells in Flow Cytometry/FACS. As can be seen from the histograms, in non-differentiating conditions (i.e. without retinoic acid) NTERA2 cells were recognised by ab16297. However, upon differentiation (addition of retinoic acid), the antibody lost the ability to recognise the cells. 2102ep Human Embryonic Carcinoma cells were stained with SSEA4 antibody ab16287. 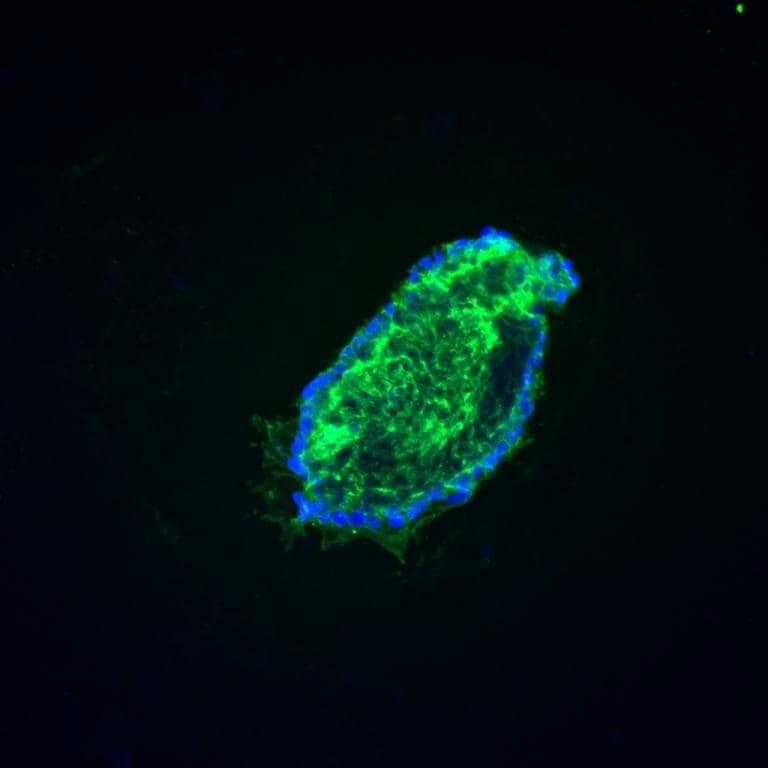 As expected, staining localised to the cell surface (green). Nuclei are stained blue using Hoechst. 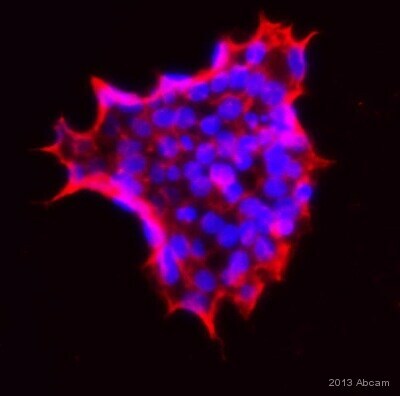 ab16287 staining SSEA4 in human Embryonic Stem Cells, HUES7 by Immunocytochemistry/ Immunofluorescence. Cells were fixed with paraformaldehyde, permeabilized with Triton and blocking with 10% serum for 1 hour was performed. Samples were incubated with primary antibody (1/100: in 1% serum, 0.1% Triton in PBS) for 1 hour at 37°C. 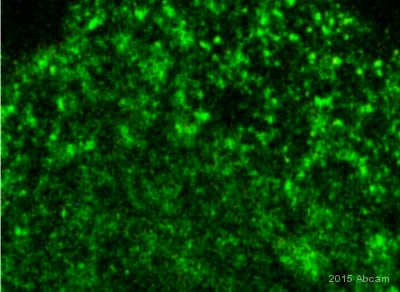 An Alexa Fluor® 588-conjugated goat polyclonal to mouse IgG was used at dilution at 1/100 as secondary antibody. Publishing research using ab16287? Please let us know so that we can cite the reference in this datasheet. I can confirm that the anti-CD24 antibody (ab110448), anti-CD44 antibody (ab119863), and anti-SSEA4 antibody (ab16287) are not conjugated to any fluorophores. A secondary antibody needs to be used. I found in our product catalogue that we offer fluorophor conjugated Antibodies against the CD24 and the CD44. You might want to have a look at on our website. I can confirm that we regrettably not have a fluorophore conjugated antibody against the SSEA4.